The Canadian Small Vessels Regulations and the International Regulations for preventing collisions (amended for Canada) require all boats to carry a minimum of safety equipment. The size of the pleasure craft determines the equipment required. one buoyant heaving line of not less than 15m in length. (This equipment is not mandatory if all people on the sailboard are wearing a Canadian-approved flotation device of appropriate size or engaged in an official competition). one manual propelling device. (This equipment is not mandatory if all people on the sailboard are wearing a Canadian- approved flotation device of appropriate size or engaged in an official competition ). a watertight flashlight or 3 Canadian approved flares of Type A,B or C.(This equipment is not mandatory if all people on the sailboard are wearing a Canadian- approved flotation device of appropriate size or engaged in an official competition ). one buoyant heaving line of not less than 15m in length. (This equipment is not mandatory if all people on board are wearing a Canadian-approved flotation device of appropriate size). a watertight flashlight or 3 Canadian approved flares of Type A,B or C. (This equipment is not mandatory if all people on board are wearing a Canadian-approved flotation device of appropriate size). navigation lights that meet the applicable standards set out in the Collision Regulations if the pleasure craft is operated after sunset and before sunrise or in periods of restricted visibility. One Class 5BC fire extinguisher .. ( IF .. the craft is equipped with a fuel burning cooking, heating or refrigerating appliance). One bailer or manual water pump fitted with or accompanied by sufficient hose to enable a person using the pump to pump water from the bilge of the vessel over the side of the vessel. (This equipment is not required for any self-bailing sealed hull sailing vessel fitted with a recess-type cockpit that cannot contain a sufficient quantity of water to make the vessel capsize or a multi-hull vessel that has subdivided multiple-sealed hull construction). One manual propelling device (paddle or oars) OR an anchor with not less than 15m of cable, rope or chain in any combination. (This equipment is not mandatory if all people on the Personal Watercraft are wearing a Canadian-approved flotation device of appropriate size). One bailer or manual water pump fitted with or accompanied by sufficient hose to enable a person using the pump to pump water from the bilge of the vessel over the side of the vessel. (This equipment is not mandatory if all people on the Personal Watercraft are wearing a Canadian-approved flotation device of appropriate size). One Class 5BC fire extinguisher. (This equipment is not mandatory if all people on the Personal Watercraft are wearing a Canadian-approved flotation device of appropriate size). The Canadian Coast Guard and P.W.C. manufacturers strongly advise against operating this type of craft at night. One Class 5BC fire extinguisher (if the craft is equipped with an inboard engine, a fixed fuel tank of any size, or a fuel burning cooking, heating or refrigerating appliance). engaged in an official competition or in final preparation for an official competition and has no sleeping arrangements. Two buckets, each with a capacity of 10 litres or more. smoke flares (flares giving off orange smoke .. only effective during daylight). 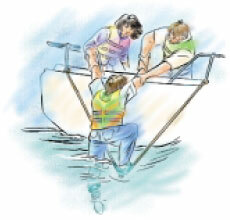 Make sure that you have a method or equipment to get a person who is in the water, back onto your boat. As required, other equipment could be added to this basic material, including a pole, a communications system, etc. (or a magnetic compass to assist the operator in determining direction, although the operator must be aware of any nearby metallic or electrical devices which are likely to distort the readings). A properly equipped boat will be of little use if the materials on board are unusable because of breakage or early wear and tear. Maintaining and storing equipment not only makes sense aesthetically and economically, but the safety of boaters and the safety of their passengers depends on it. There are two main types of flotation devices: life jackets and personal flotation devices (PFD). PFD's are increasingly popular because they are designed for comfort and thermal protection. As a rule, the more body surface covered by the PFD, the better its thermal protection. PFD's exist in vest and suit form. Although more expensive than life jackets, PFD's offer better protection, more comfort and more elegance. PFD's and/or life jackets approved status will become void if they have been repaired or altered. Do not dry PFD's in sunlight. Note: Never use your PFD or life jacket as a fender or a cushion; damaging them voids their approved status. PFDS and/or life jackets must fit snugly while allowing free movement of legs and arms. Only red, yellow or orange life jackets meet Government of Canada standards. PFDs however, come in a wide variety of styles and colours. Kapok, often used to manufacture life jackets and cushions, is contained in vinyl coverings which are easily punctured. Kapok deteriorates quickly and loses its buoyancy. Kapok can support 25 times its weight. Polyethylene and airex are two very common types of foam. Foam is a very long-lasting buoyant material. Regularly check that life jackets or PFD's are still properly buoyant. The foam should not be too rigid. Kapok sacks must be light, soft to the touch and puncture-free. Life jackets and PFD's should be worn on board. They should not be used for kneeling, sitting or as a fender. When wet, rinse flotation gear in fresh water and hang to dry in the open air or a well-ventilated location. Do not expose them to direct heat. Store life jackets and PFD's in a cool, well-ventilated area. Clean with mild soap and water. Strong detergents, dry cleaning and petroleum products can damage flotation gear. Properly maintain and store your boat and its cargo. Be aware of effects: waves, sounds, coordination and reflexes. Fasten the device to fit snugly. As a safety measure, the operator of a pleasure craft should read the manufacturers instructions before using pyrotechnic distress signals, and check the expiry date. It is important to note that the pyrotechnic distress signals to be carried on board a pleasure craft must be approved by the Department of Transport Canada, in accordance with the Small Vessels Regulations, Material Standards - Pyrotechnic Distress Signals. As well, the operator should locate the required safety equipment in readily accessible places on board the craft. Their roles in the event of emergencies. Responding to hull leaks or flooding. Locate the source of the hull leak or the flooding. The operator of a pleasure craft should carry on board at all times tools and materials to temporarily stop hull leaks or flooding. Responding to capsizing, swamping, sinking and grounding. Weak, irregular or absent pulse or respiration, loss of consciousness at final stage. Applying warm dry objects (40 to 45C). and Use or exhibit signals to indicate distress and need of assistance if necessary. If in a group, huddle with other persons by getting the sides of everyones chest close together with arms around mid to lower back and legs intertwined. shall make sure that the personal flotation device and/or life jacket keeps the chin above water so that it is easy to breathe.